« An Avalanche of New Stuff! Vernal equinox is today, one of those rare March 20th ones at that, but we’re on the ball. 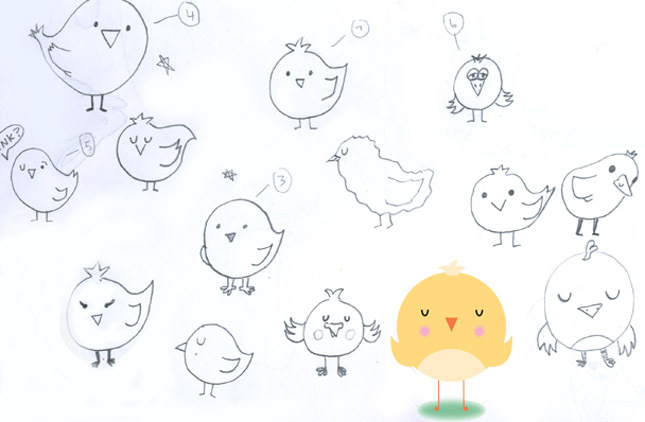 In honor of budding trees, green grass and hatching eggs, we bring you some sketches of little chicks from artist Trish Tatman! We particularly like the smiling one on the far right. JibJab is set to unleash a cavalcade of chicks, ducks and bunnies just in time for Easter, so stay tuned! This entry was written by paulhanges and posted on March 20, 2009 at 4:33 pm and filed under Production Art, Sneak Peeks. Bookmark the permalink. Follow any comments here with the RSS feed for this post. Post a comment or leave a trackback: Trackback URL.